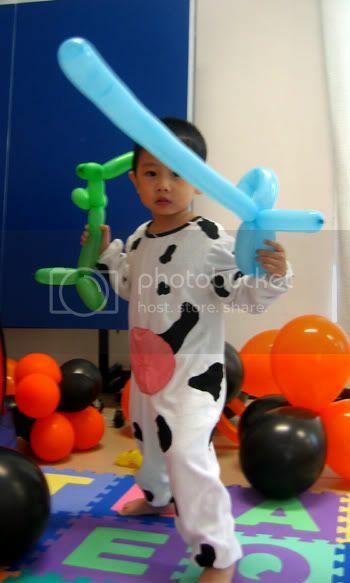 kiddy halloween.. - A mummy's inane blabberings.. 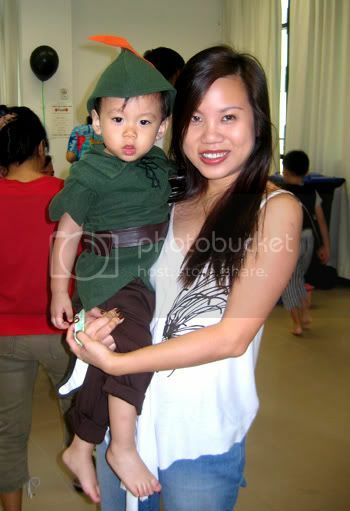 Remember the Robin Hood costume I bought from Hong Kong? Yeah, it's still too big for Aidan.Check out the humongous brown boots! 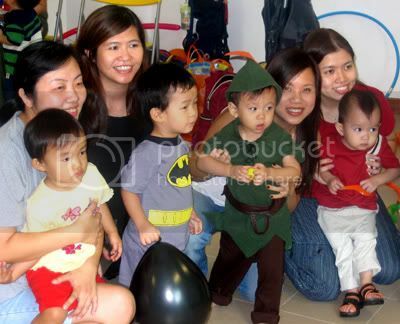 moi and my blur looking Robin..
Red Ranger was there too..
And so was moo moo..
mmnchua and Nicole, sonday and Batboy aka Ryan, moi and Mr Hood, laurapoon & Caleb..
Hmm..the kids look really sian man..
And there was his first Halloween Party...where lotsa kids came in costumes.. This time round, there weren't that many kids in costumes so Aidan was sorta 'overdressed' but heh..he seemed to like his costume. Even though the hat was kinda big for him, he didn't mind wearing it and made sure it stayed put on his head..He was a li' grouchy later though 'coz he didn't have a nap in the afternoon..and after we went home, he started having a temperature *sigh*.. I guess it could be due to the crazy weather we've been having. 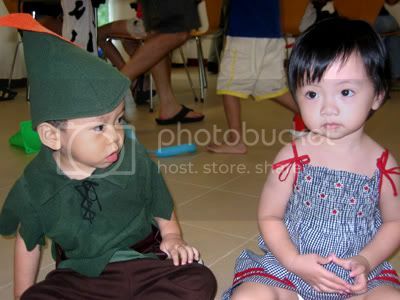 Fortunately, it's only mild fever and I'm sure he'll be well soon..
Awwwwwwwwww, cute kids all around. I still remember Aidan as tigger ... man, has it been a year already? Time sure flies huh? 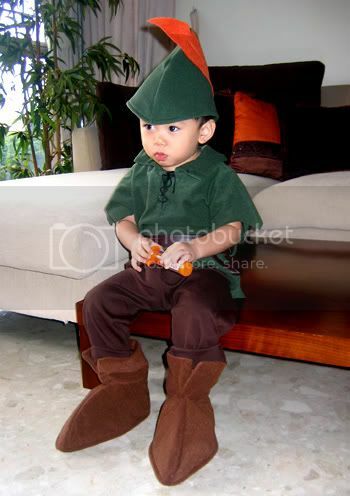 He looks darn cute in the Robin Hood costume lah, but how come the boots so enormous one? Hmmm, it could be a good thing in later life though ... y'know what they say about men with big feet right? Hahaha! heh..i thought claudia had that look that said "men don't geddit!".. hey how do u add the pict (aidan n dad) beside the entry ??? Aidan seems to hv shag some weight... nice picts ! Aidan didn't really lose weight but coz he's growing taller and is leaner, he looks slimmer..
To add the pics, u gotta do advanced customization using layers. But u need to have a paid account to do it..I had to go tru some tutorials ..lemme know if u want further instructions..
My abang says you lost weight! 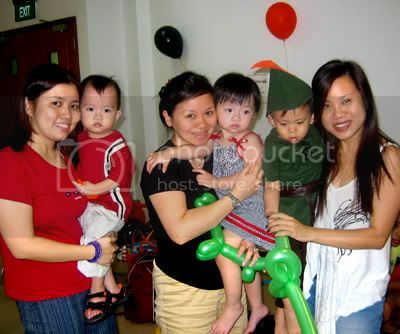 weight never :( still same weight..
heh..having kids aint an easy task actually..
OMG its been a year... damn. i still remember the pumpkin and the tigger! hahaha..
and my mom has the same top! err..dunch know..i bought it at stanley market in hongkong :D.. He looks very dashing! 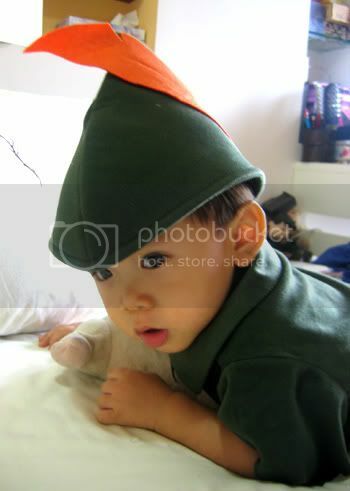 At first I thought it was a Peter Pan costume but of course, it's Robin Hood! You look good too in the pics! heh..they sure do..too fast at times..miss his baby days..
Tell me about it! It's been a year!!!! I could still remember us dressing up our li' ones for last year's Halloween .. at that time, they couldn't even walk .. this year, our kids actually played games!! he looked really blur...hehe... but forever so cute!!! 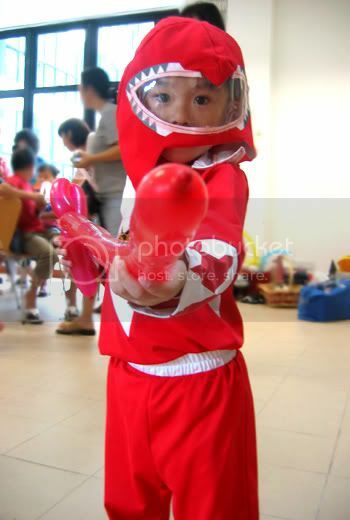 only toddlers can look so cute in costumes lei!